Now you know the title of my Layers' Tweets Challenge quilt entry - Feeling Blue. And, true to form, the title bears layers of meaning. 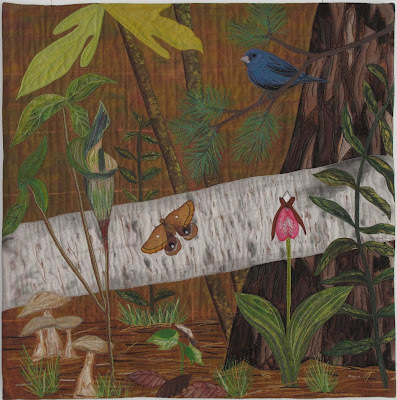 Feeling Blue features a bird I used in a previous quilt - Spring Sermon: Hawk Mountain. That's an indigo bunting sitting in the pine tree in Spring Sermon: Hawk Mountain. Once you've seen one you won't forget it. They are a brilliant blue, demure little bird - lovely, isn't he - it's a male, the female are a lovely brown? "Feeling Blue" has more meaning than just the color of the indigo bunting - but it's not as depressing as it might sound - don't worry about me - I'm fine. This quilt has given me the opportunity to address my feelings about becoming an empty nester - you'll see - it's been good for me. One more days - then the big reveal.